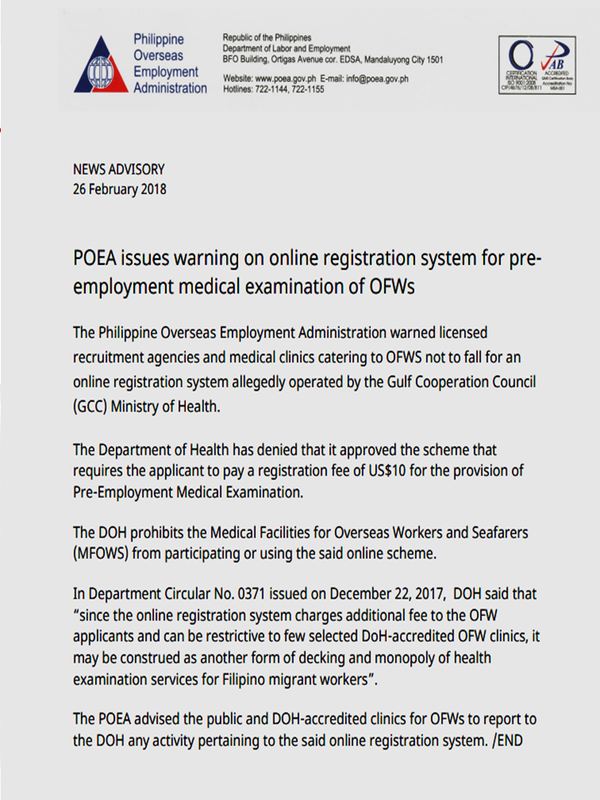 The Philippine Overseas Employment Administration has issued a warning to all licensed recruitment agencies and medical clinics catering to OFWs not to be duped by an online registration system allegedly operated by the Gulf Cooperation Council Ministry of Health. The Philippine Overseas Employment Administration has warned licensed recruitment agencies and medical clinics catering to OFWs not to be duped by an online registration system allegedly operated by the Gulf Cooperation Council Ministry of Health. In an advisory, the POEA said the Department of Health (DOH) has denied claims that it approved the scheme that requires the applicant to pay a registration fee of $10 for the provision of Pre-Employment Medical Examination. The DOH prohibits the Medical Facilities for Overseas Workers and Seafarers (MFOWS) from participating or using the said online scheme. In Department Circular No. 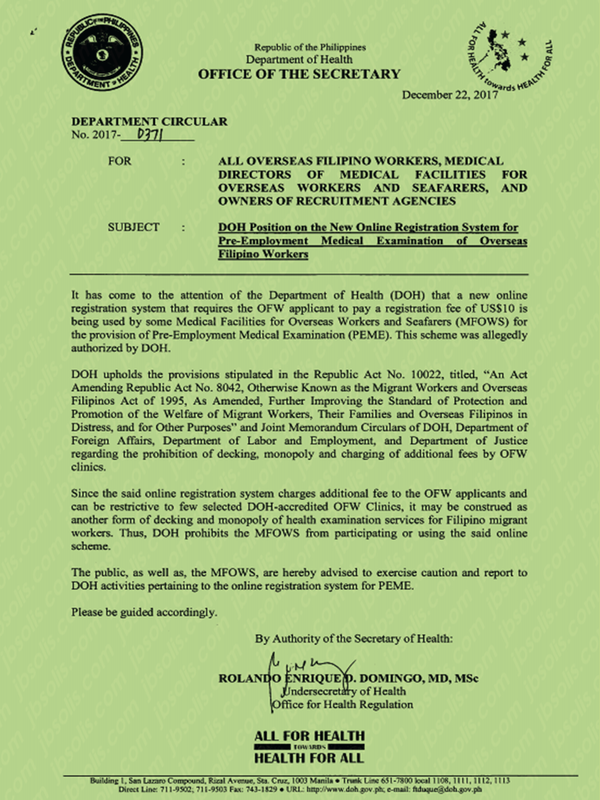 0371 issued on December 22, 2017, the DOH said that "since the online registration system charges an additional fee to the OFW applicants and can be restrictive to few selected DOH-accredited OFW clinics, it may be construed as another form of decking and monopoly of health examination services for Filipino migrant workers". 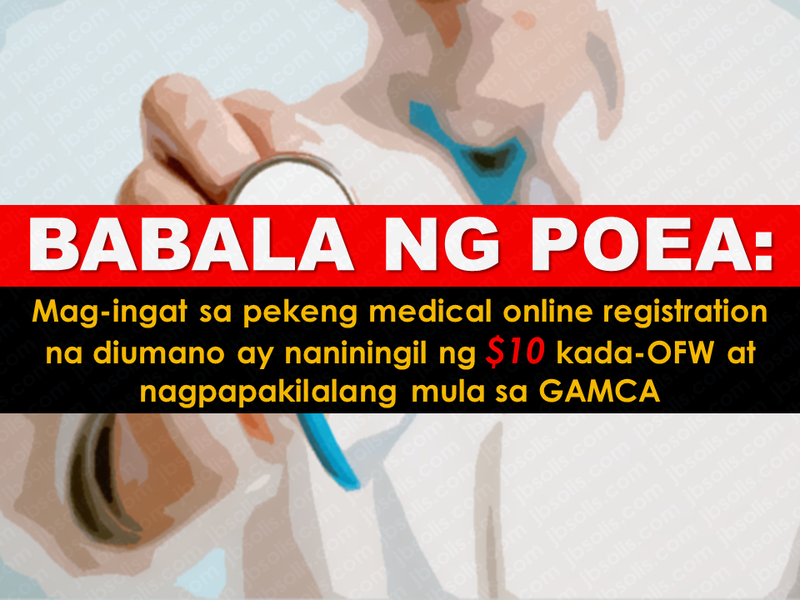 It has come to the attention of the Department of Health (DOH) that a new online registration system that requires the OFW applicant to pay a registration fee of US$10 is being used by some Medical Facilities for Overseas Workers and Seafarers (MFOWS) for the provision of Pre-Employment Medical Examination (PEME). This scheme was allegedly authorized by DOH. DOH upholds the provisions stipulated in the Republic Act No. 10022, titled, “An Act Amending Republic Act No. 8042, Otherwise Known as the Migrant Workers and Overseas Filipinos Act of 1995, As Amended, Further Improving the Standard of Protection and Promotion of the Welfare of Migrant Workers, Their Families and Overseas Filipinos in Distress, and for Other Purposes” and Joint Memorandum Circulars of DOH, Department of Foreign Affairs, Department of Labor and Employment, and Department of Justice regarding the prohibition of decking, monopoly and charging of additional fees by OFW clinics. Since the said online registration system charges additional fee to the OFW applicants and can be restrictive to few selected DOH-accredited OFW Clinics, it may be construed as another form of decking and monopoly of health examination services for Filipino migrant workers. Thus, DOH prohibits the MFOWS from participating or using the said online scheme. The public, as well as, the MFOWS, are hereby advised to exercise caution and report to DOH activities pertaining to the online registration system for PEME. Please be guided accordingly. 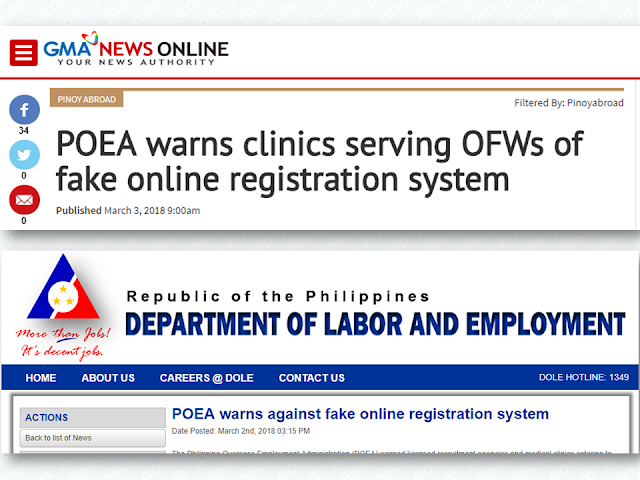 The POEA advised the public and DOH-accredited clinics for OFWs to report to the DOH any activity pertaining the said online registration system.